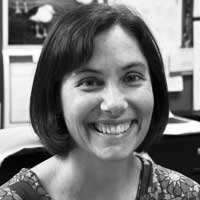 Eva Emerson '94, editor-in-chief of Science News. Eva Emerson, a 1994 graduate of the Science Communication Program, is the new editor-in-chief of one of the country's most venerable science periodicals, Science News. Emerson will oversee a Washington D.C.–based staff of reporters and editors that assembles the Science News family of publications. The magazine itself, founded in 1922, is now a biweekly print publication with a circulation of 110,000. SN Prime is a weekly tablet edition for the iPad, while the publication's website—updated daily—now attracts about 5 million unique visitors annually. In addition, Science News for Kids draws more than 3 million students, parents, and educators annually. Emerson is joined at the top of the masthead by managing editor Matt Crenson, formerly of the Dallas Morning News, Associated Press, and ABC News. "Eva and Matt are exactly the right people to lead Science News into its digital future, not only with their solid journalistic talents and experience, but also with their dedication to producing thought-provoking, objective and compelling science journalism," says Mike Mills, chief content officer of the nonprofit organization Society for Science & the Public, which publishes Science News. "Eva combines the essential traits of an effective newsroom leader," Mills continues. "She's a great listener, but she also uphold the highest standards that have long guided Science News." Both Emerson and Crenson, Mills notes, "have an impressive grasp of a wide variety of scientific disciplines." Emerson earned her B.A. in biology from UC Santa Cruz, then completed the SciCom program in 1994. After an internship at United Press International, she held staff positions at The Magic School Bus television show, the Honolulu Weekly, and the California Science Center. She also was associate director of communications for the University of Southern California College of Letters, Arts & Sciences, where she edited the alumni magazine and covered campus science. She is coauthor of a book of classroom activities, Naturescope Kit: Habitats, published by the National Wildlife Federation. She joined Science News as managing editor in 2007 to help oversee a redesign of the magazine and a relaunch of the website. Many graduates of the SciCom program have worked at Science News as interns or staff writers, including current chemistry reporter Rachel Ehrenberg '03, astronomy reporter Nadia Drake '11, and interns Meghan Rosen '12 and Tanya Lewis '12.